Longtime White House correspondent Walsh (Feeding the Beast, 1996, etc.) cracks few eggs in his soufflé-light account of the world’s most famous airplanes and their VIP passengers. Presidents behave on Air Force One much as they behave elsewhere, only more so, states the author. This unremarkable thesis does little to buttress Walsh’s insistence that the Chief Executive’s plane is in the same symbolic league as the Statue of Liberty and the White House. He notes there are now two identical 747s (just in case), as well as a little-known “doomsday plane” that carries even more sophisticated electronics. Walsh begins with the first president to fly, FDR, who made three flights. Truman was the first to fly routinely (his DC-6 was called Independence), and those who liked Ike will remember his Columbines I and II. 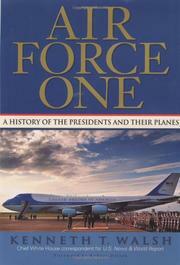 It was during Eisenhower’s presidency that the plane became known as Air Force One. JFK ordered “United States of America” painted on the fuselage, and LBJ, who memorably took the oath of office on board in Dallas, on later flights drank heavily, belched, ogled women, and “saw the plane as a private reserve and all-around locker room.” Nixon, who preferred to be alone, received a new 707 in December 1972 and rechristened it The Spirit of ’76, a name that failed to catch on. (Walsh reveals that Syrian MIGs once flew so close to the craft that Nixon’s alarmed pilot took evasive maneuvers.) Ford, the most popular of all with the flight crews, restored the name Air Force One. Carter liked to give out leather-bound autographed Bibles. Reagan used the plane as a powerful political prop. Bush I outlawed broccoli on board. Clinton stayed up all night. And Walsh’s extremely uncritical and credulous account follows Bush II from Louisiana to Nebraska on 9/11 before returning to Washington.